The content backbone of the St. Matthew Passion is the account of the suffering and death of Jesus Christ according to the Gospel of Matthew. It is supplemented by interspersed passion chorals and edifying poems by Picander in free choirs and arias. 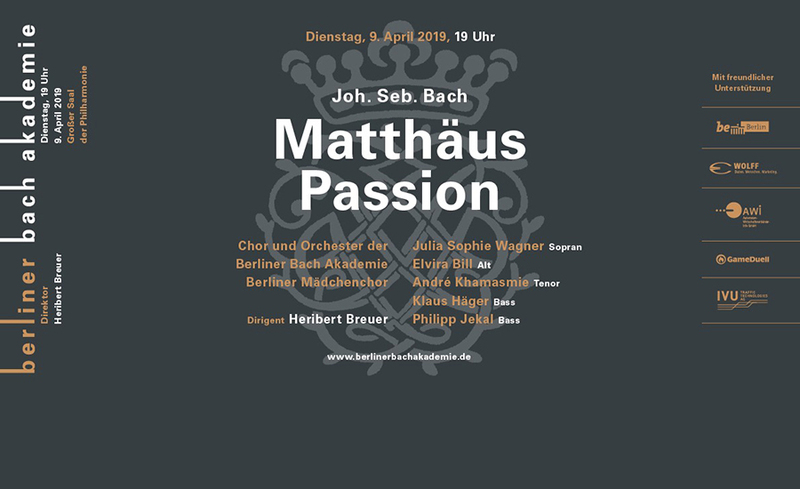 The St. Matthew Passion is next to the St. John Passion the only completely preserved authentic Passion by Johann Sebastian Bach. The St. Matthew’s Passion is Bach’s most extensive and most busy work and represents a climax of Protestant church music. The world premiere took place on April 11th, 1727 in the Thomaskirche in Leipzig. After Bach’s death, the work fell into oblivion. The work found its way into the general public only in 1829, when it was re-performed by the Berlin Singakademie under the direction of Felix Mendelssohn Bartholdy, who was only twenty at the time.